The “Summer of Iced Coffee” continues here at the Institute. 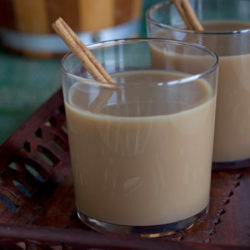 Today’s recipe is a cross-cultural mash-up of Horchata (the Mexican rice milk drink) and that French classic, Café au Lait. You can learn to roast and cold brew the coffee that goes into this recipe, or use a store-bought substitution, if you must. Place rice and almonds in a heatproof bowl or pitcher. Break cinnamon into a few pieces and add to container with 2 cups of hot water. Cover and allow to sit at room temperature for 6-8 hours or overnight. In a separate bowl, combine sugar and 4 cups hot water, stirring until sugar is dissolved and mixture turns clear. Set aside to cool. Puree the soaked, rice/almond/cinnamon mixture in a blender for 3 minutes or until smooth. Strain through a cloth nut-milk bag, very fine sieve, or cheesecloth. Discard solids. Add the cooled sugar syrup and vanilla to the strained mixture and stir to combine. Store in the refrigerator to chill.